Waipahu is located along the northern shore of the Middle and West Loch of Pearl Harbor. Both H-1 and Farrington Highway run east-west through the length of Waipahu. The neighboring areas of Waipio, Village Park, Royal Kunia and Waikele use the Waipahu zip code. Waikele is located across the H-1 freeway north of Waipahu. 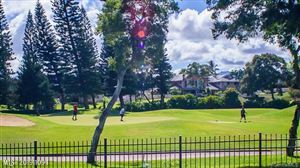 Waikele consists of newer subdivisions and an upscale outlet shopping center and world famous golf course. To the west via either roadway you can reached Kapolei and Makakilo or Ko'Olina and the Leeward coast. At the western end of Waipahu is Kunia Road which leads to the newer neighborhoods of Royal Kunia and Village Park, and eventually on up across the central plain to Kunia and toward Mililani, Wheeler Army Airfield, Wahiawa and Schofield Barracks and the North Shore if you keep going. Based on information from the Multiple Listing Service of Hicentral MLS, Ltd. Listings last updated on Apr 23, 2019 4:51:pm. Information is deemed reliable but not guaranteed. Copyright: 2019 by HiCentral MLS, Ltd.